Utilizing over 8,000 volunteers annually, the Food Bank of the Southern Tier relies heavily on donated time to achieve its mission of building and sustaining hunger-free communities. 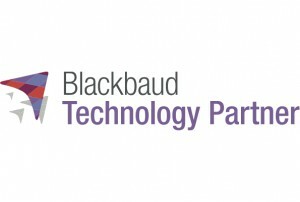 With so many new faces coming through its doors each year, the organization also realizes the potential impact these individuals can have on achieving its operational goals. 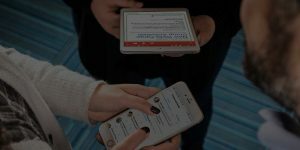 The Food Bank had already adopted The Raiser’s Edge (hosted edition) as its CRM of choice for managing donor information. So, when the time came to select a volunteer management software application, VolunteerHub was the natural fit. 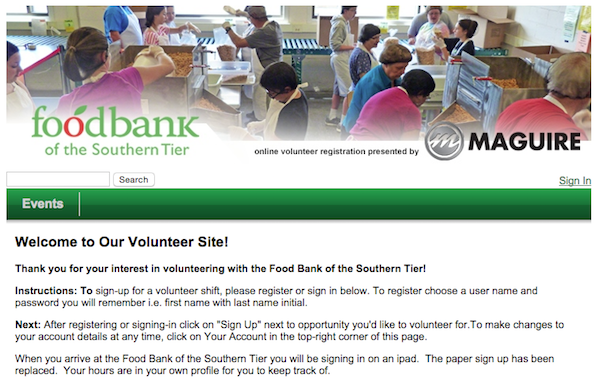 At the recommendation of another food bank, the Southern Tier team learned about VolunteerHub. After digging into the features and learning about VolunteerHub’s integration with The Raiser’s Edge, the organization decided to move forward in late 2014. “We did our due diligence and considered a few other volunteer systems, but VolunteerHub was head and shoulders above the rest,” said Natasha. Shortly after implementation and training, Nancy and her team got to work building event pages in VolunteerHub. In addition, the Food Bank designed a communication plan to educate volunteers about the new system. “We started by posting flyers in the volunteer lounge and also engaged directly with influential volunteers. We worked to get their buy-in for the new volunteer system and then asked them to promote it with others,” commented Nancy. The net result was a smooth transition to the cloud. Within a three-month period, the organization had all of its volunteers and events stored securely in VolunteerHub. The days of handwritten notes and Outlook calendar reminders became a distant memory. 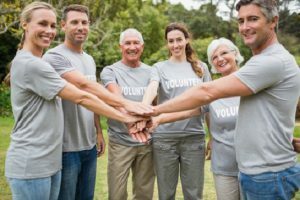 By automating volunteer and event management through VolunteerHub, the Food Bank of the Southern Tier now has more time to develop engagement strategies. Instead of relying on anecdotal information, the organization now has a treasure trove of data at its fingertips. The Food Bank has even developed a number of new volunteer events, which, prior to VolunteerHub, would have been practically impossible to organize. VolunteerHub even opened up new opportunities to engage with corporate sponsors. The feedback from volunteers has been overwhelmingly positive. Volunteers are able to browse and register for events that appeal to them – all from the comfort of their homes or offices. Instead of filling out paper registration forms or liability waivers, everything is now handled electronically within VolunteerHub. Volunteers also benefit from the integration with The Raiser’s Edge. With each new volunteer account created in VolunteerHub, a matching constituent record is automatically built in the organization’s CRM. This ensures that each supporter receives the Food Bank’s emails, calls, and texts – for both volunteerism and fundraising. For our team at VolunteerHub, this type of feedback keeps us motivated to serve more nonprofits – and, in turn, help more people.